Many of you are probably wondering where I have been locked up recently as I have been rather silent on my blog. Well, the truth is I have been running around on the conference circuit at events like the AGC IT Forum, CPC OI Summit and Bluebeam eXtreme. I didn’t even get to attend all of the events this month as I am taking some much needed vacation next week, but before I go I had to share what happened today at one of our job sites. I have been working with the Team over at Alive.ai on some drone projects. 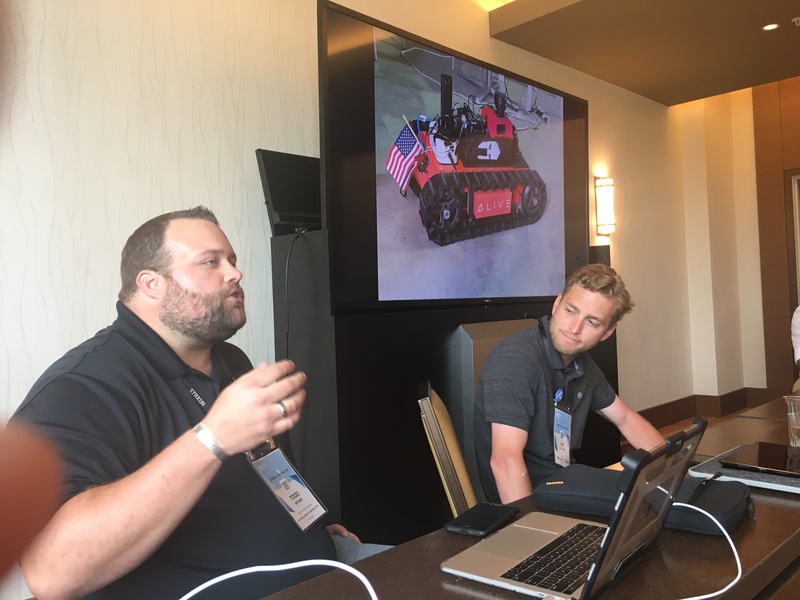 Todd Wynne (@Todd_Wynne) was nice enough to share some of his time at his Future of Construction Technology round table at Bluebeam eXtreme and we shared a bit about the Rovers we were testing out. There was a lot of discussion and rightfully so a lot of doubt about what these things could actually do, so I knew I had to get some real jobsite footage of these drones. So I did what any self respecting ConTech geek does and begged the guys at Alive.ai to come out to the job while I had a Procore video team out there. Ok I didn’t have to beg but they literally got off a red eye and came to my job right after, so I owe them one. What we got was pure unadulterated excitement from me and my whole team. One of my supers, just had to take it for a ride. After the fun was over we put the Rover to the test. So, what can this rover do? 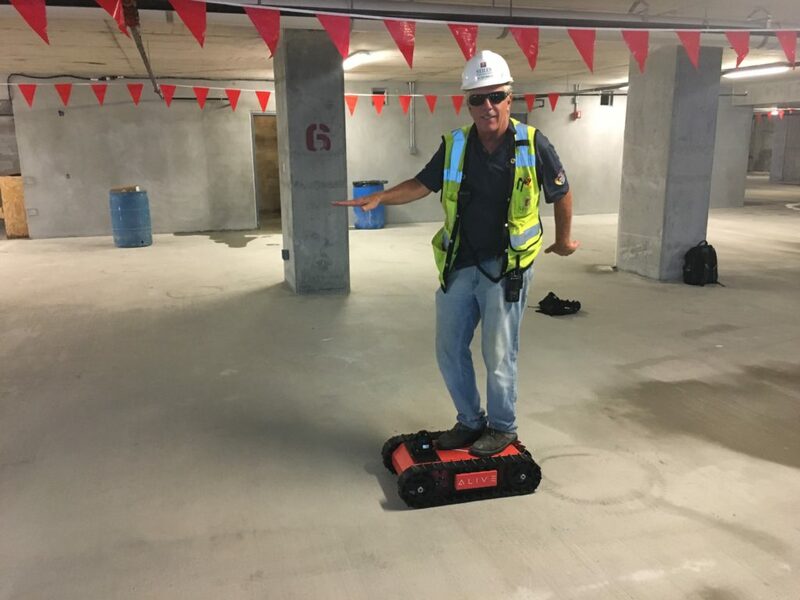 The Rover is an autonomous platform that can be used to perform tasks on your jobsite. Much like an aerial drone a path and data collection points can be set in the application and off it goes. But what happens when something gets in its way, there are no obstructions in the sky? Much like the DJI Phantom 4 Pro it has collision avoidance based on cameras and computer vision, so it avoids objects on the jobsite and reroutes its path continuing its data collection. Some of you said yeah but that is only good for one floor of the building it can’t go up stairs, oh yes it can. What it can’t do is open doors. The expansion of this is pretty endless and extremely exciting. What kind of data can I collect with the Rover? The videos and pictures just show the Rover platform without any of its sensors, we wanted to test it on the jobsite and see how it handled real world conditions. You can mount pretty much anything to this, I’m over 250lbs and stood on it and it chugged along without missing a beat. We want to mount 360 cameras to it first, collecting photos and video throughout the project autonomously. We are also doing some testing with traditional laser scanners and moving between scan locations and scanning them moving on. Maybe we can even build a BIMBox into this thing and process on the fly. I can also see Slam scanners like the Paracosm scanner mounted to it to collect continually registered scans. Really if the hardware has an SDK they can probably control it. Maybe even DeWalt (@DewaltTough) will let us tie into their Wi-Fi so we can transmit data more efficiently. There are limitless combinations of sensors we could mount on this. how does a Rover save me money? Our first worklfow we are testing is 360 photos. The capture of 360 photo using tools like StructionSite (@StructionSite) is a great process but it still requires dedicated manpower to complete. So why not partner our Rover with StructionSite and automate the process. We plan out a collection map, set the rover’s starting point and set it and forget it. Look at the data the next morning and see where we need to focus. Now there is still work to be done but this is in the near future. Right now, you’re asking yourself, “That thing has to cost a fortune, how can that be cost effective?” They have not set pricing yet but I am told that depending on the sensors on the unit they will run around $15k. Now if that holds true, I could theoretically take photos everyday on my project instead of every week for less than half of a Project Engineers salary. What is next for the Rover? Well next week we will be testing it on site with a 360° camera shooting video and images. Alive.ai has pilots set up with several companies and they are looking for more opportunities and interesting workflows. I even heard of someone trying to collect soil samples with the Rover. Follow these guys closely as I am sure you will start seeing them at some of the upcoming events. Stay tuned as we shot some more cool video that I will be adding describing the unit more and without my finger in it.